On Thursday, February 3, 2011, Albany State University, in conjunction with The Humpty Dumpty Institute’s Higher Education Alliance for the United Nations, hosted Asha Castleberry to speak on Challenges to World Peace. 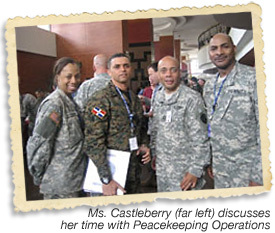 Ms. Castleberry is a foreign policy specialist and is currently a U.N. Public Affairs Officer. She is also a military officer and cofounder of the International Youth Council, a youth-led NGO affiliated with the United Nations. 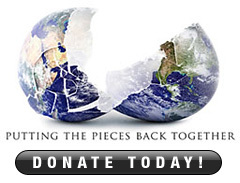 She has been working on issues related to international peace since 2006. Ms. Castleberry also serves in the U.S. Army Reserves and New York National Guard. Ms. Castleberry opened her discussion by talking about the role of female military peacekeepers and the low representation of females in senior leadership positions within the military. She spoke about the lack of gender perspectives in policy decisions and the importance of the U.N. Security Resolution 1325. This resolution, adopted unanimously on October 31, 2000, called for the adoption of a gender perspective that included the unique needs of females and to support their participation in peace negotiations and post conflict reconstruction. Ms. Castleberry ended by talking about her current job as a U.N. public affairs officer, where she manages media coverage focusing on peacekeeping. After capturing the 300+ students and faculty members’ attention, she opened to floor for questions and was able to interact with several students after the lecture. If you would like more information about the Humpty Dumpty Institute's Higher Eduacation Alliance please conact Joshua Linder.